S, 1992-95, 30 games + 24 repl. Qld rep (1994 & 1998-2003. Super League tri series: 1997). Townsville youngster signed with Saints in 1992. The 'Raging Bull' made an immediate impact with his trademark busting runs up the middle of the ruck. Tallis played in the 1993 grand final and was selected for Queensland in 1994. During the Super League conflict, Tallis was snared by the Broncos and the firey second rower opted to sit out the 1996 season rather than play out his contract with Saints who refused to release him. Against the odds, the Dragons went onto that year's grand final without Tallis who played Rugby Union to keep fit. Tallis joined the powerful Brisbane side in 1997. One of the greatest second rowers of his generation, Tallis realised a dream when he was named as Australian captain in 2002. Tatana, Henry S, 1975-76, 42 games + 1 repl. Top club scorer for 1975 (117pts), Tatana kicked St George through to that year's semi-finals. Played in the 1975 grand final. Henry was the club's top point scorer again in 1975 (117pts) and 1976 (105pts). Later became captain-coach and then president of the Cessnock club. Passed away suddenly following a heart attack in June 1998, in Brisbane, aged just 53. I, 1994, 2 games + 1 repl. 1t, 5g (14pts) Fullback. Utility back. Made his first grade debut at the age of 29. Taylor could play fullback, centre or five eighth. Went on to involvement with Thirroul RLFC. Junior Club: Joondevup Gaints , Perth. First grade debut: Dragons (v Panthers), 19 March 2006, WIN Stadium (Rd 2). 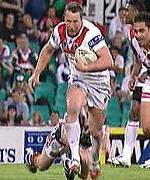 Lee Te Maari linked up with the Dragons in 2005 following a stint with the North Sydney Bears. Te Maari was released at the end of 2006 and has been contracted to the Canterbury Bulldogs in 2007. S, 1991-94, 16 games + 19 repl. I, 1994, 5 games + 1 repl. Souths junior broke his leg while playing with the Rabbitohs. Came back to play in Canterbury's 1988 premiership winning side. Shifted to Wests and was captain before having a falling out with coach Warren Ryan. Finished first grade career with Illawarra. Thompson, Darren I, 1984, 1 game. (0pts) Fullback. Born: 16 Feb 1978, Sydney. St George junior (Hurstville United). First Grade debut: Saints v Cronulla at Caltex Field, June 24, 1995. Played in 1996 and 1999 grand finals. Represented City Firsts as captain in 2001. He also played for City Origin in 2003 and 2004. Thompson declared his passion as a true clubman when he once exclaimed, "I would die for StGeorge"
Took a pay cut for 2004 so the club could re-sign other star players under the salary cap. In 2004, following a series of stand-out performances, Thompson was named in NSW's 30-man State of Origin training squad. Thompson played all 26 games (including two semi-final appearances) in 2005, often defying injury. He was contracted to play with Saints in 2006 but a much publicised falling out with the club saw him released. Thompson signed with the Sharks for 2006. 6t, 1fg (24pts) Five eighth. Thompson, Warren S, 1970, 9 games. 5t (15pts) Centre. Five eighth. Winger. A competitive sprinter, Thompson captain-coached Wollongong Norths in 1967. Previous Clubs: Foxton Rebels, Unton Cobras, Innisfail Leprechauns. First Grade Debut: 1/6/2007 (Round 12), Dragons 11 v Broncos 4 at Kogarah. Ricky Thorby is contracted with Saints until 2009. Following three tries in six top grade games, Thurgate played in the 1984 President's Cup squad, but never returned to play first grade again. Tiernan, Phil I, 1989-91, 12 games + 9 repl. An Illawarra junior, Tiernan was a member of Helensburgh's premiership winning side. Went on to play with the Parramatta club. S, 1990-93, 30 games + 27 repl. Formerly from Wynnum-Manly, Tierney won the Brisbane competition's Rothmans Medal in 1989. Joined St George (1990-93), Wests (1994-95) and Manly (1996-98). Didn't play with Saints in the 1992 and 1993 grand finals but played against Saints with Manly in the 1996 grand final. Position Centre, lock forward, second row forward, five eighth. A graduate of Kiama High School, Shaun Timmins went on to an illustrious career playing in nine State of Origin clashes for New South Wales and eight Tests for Australia. In all, Timmins played 210 first grade club games including number of matches for Saints as stand-in captain. A powerful runner and ruthless defender, Timmins was selected to play for NSW in 2000. In the same year, he suffered a leg injury which revealed a worsening knee condition and required a bone graft. The rare condition sidelined the State of Origin star for approximately 18 months. Timmins returned to the field in 2002 and showed tremendous ability to again represent NSW and then Australia in the July Test match against Great Britain. He was named the club's best player in 2002. In 2003, Timmins played Country Origin. Then, after just one match at five eighth for Saints, Timmins gained further rep honours when selected at five eighth for NSW. Unfortunately, Timmins was unable to join the Kangaroo Tour of 2003 due to ongoing knee problems and underwent what was his fifth knee operation. Following another comeback from injury, Timmins once again stamped his authority on the competition, gaining selection for the Kangaroos in the 2004 'Anzac' Test match between Australia and New Zealand. In the same year, Timmins was selected for NSW and was named man-of-the-match in Origin 1 after kicking the winning field goal in extra time. Following the 2004 Kangaroo tour of Great Britain, France and the USA, Timmins announced his retirement from representative football, stating that he would be focussing on winning a premiership with the Dragons. In 2005, Timmins played 25 first grade matches (out of 26) including two semi-final appearances. In 2006, Timmins overcame injuries to play 11 first grade matches and feature in the Dragons charge into the finals. In both the 2005 and 2006 seasons, Saints fell one game short of qualifying for the grand final. In late 2006, with ESL and Gold Coast contracts put away, the 30-year-old Timmins eventually took doctor's advice and announced his retirement from the game. S, 1932-33, 1936 & 1943-44, 25 games. 1t, 1g (5pts) Winger. Centre. Five Eighth. Fullback. St George RU convert, Tipping had a horror run with injuries which included a broken back in 1936. Coached St George in the 1950s and was the coach when Saints won the 1956 Grand Final which commenced their 11 year reign as premiers. He was ruthlessly sacked as coach at the conclusion of the 1956 season to make way for Ken Kearney but remained with the club as the Presidents Cup coach despite offers from Wests. One of the most passionate club men to ever come out of St George, Norm Tipping passed away in 2002. S, 1968-72, 60 games + 5 repl. A popular player, Apisai Toga came to Saints from Fiji and also played with Lancashire club Rochdale (UK) in the late 1960s. In 1973, Toga collapsed during a training session and later tragically died of tetanus poisoning; an injury sustained while diving amongst coral in Fiji in the off season. Toga, Inosi S, 1969-74, 5 games + 7 repl. Born 1 July 1976 in Casino, NSW. Previously played with Manly and Northern Eagles (1998-2004), debuting in first grade in round 1 of 1998 (Manly v Brisbane at ANZ Stadium, March 13, 1998). Torrens was known for his hard hitting and no nonsense style of play in both defence and attack. An experienced campaigner, Torrens provided good service for Saints in 2005, filling in while regular first graders were unavailable through representative duties or injury. After just one season with St George Illawarra, Torrens went on to play with the Huddersfield Giants in the UK. S, 1922-28 & 1930, 96 games. 28t, 46g (176pts) Five eighth. Goal kicker. Saints captain in 1925 and 1926 and the first clubman to play 100 grade games. Played a brilliant individual game against Souths at the SCG in 1926. Top first grade point scorer for club in 1926. Played in Saints' first premiership-deciding final appearance in 1927. Arnold Traynor was also involved in the Earl Park Riot of 1928. Played in the famous runners up side of 1930. S, 1997-98, 39 games + 1 repl. SI, 1999-2001, 66 games (incl repl). 18t (72pts) Second row forward. Signed with Salford for 2002. Originally from Oberon, played with Thirroul and Corrimal in the Illawarra competition. Played for NSW against Great Britain in 1979 and played for NSW in 1980 in a non-Origin match at Leichhardt. Played for Yenda in 1984 before joining Penrith in 1985. Went onto player-coach with Nambucca Heads (NSW) in 1986. I, 1997-98. 19 repl. (0pts) Second row forward. Dapto junior and returned to Dapto after 1999. S, 1922 & 1924, 3 games. (0pts) Played in initial second grade match in 1921. Captain of second grade runners-up side in 1923. Turner, Graeme S, 1966-69, 17 games + 4 repl. Turvey, Cedric S, 1942, 6 games. 1t (3pts) NSW rep (1941). Played in 1942 grand final losing side and only ever played first grade with St George. SI, 2002, 19 games (incl repl). Born: 23 Jan 1980, Sydney. Represented Combined First Division in 2001. Played one first grade game with the Roosters in 2001 before joining Saints, scoring four tries in 2002. Received 'Mark Coyne Award' for Premier League Player of the Year but was released at the end of 2003. NSW rep (1919 & 1921). A former Wests forward (1914-16 & 1919-20), Clarrie Tye brought a wealth of experience to St George. A tough and durable front rower, Tye was one of Saints' best players from 1921-27. In a career of many highlights, he scored the match winning try in Saints first ever home game at Hurstville Oval in May 1921. Club captain in 1923. Played in Saints' first premiership-deciding final appearance in 1927. In 1928, a club testimonial of £50 went to Clarrie Tye for services, on and off the field . Queenslander played in 1941 Grand Final victory and was sent off along with Easts' forward, Jack Arnold. Went onto to captain Australia in 1948-49 and became president of Southern Suburbs Leagues Club in Brisbane in the 1960s. Older brother of 1956 Kangaroo, Tom Tyquin. I, 1984-88, 66 games + 1 repl. S, 1989, 3 games + 2 repl. (0pts) Fullback. Centre. Five eighth. Lock forward. Second row forward. Prop forward. A versatile running utility, Upfield represented Country Origin in 1988. Achieved success with Illawarra but was unable to match it with stints at St George and Balmain. Went to play and coach in Nowra, Wagga, Bathurst, Wollongong and Orange.